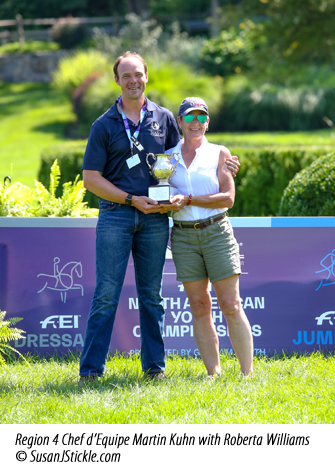 Lexington, KY (August 17, 2018) - The United States Dressage Federation™ (USDF) is pleased to announce that the Albers Award perpetual trophy was awarded to Region 4 Chef d&apos;Equipe Martin Kuhn, at this year&apos;s USDF North American Youth Dressage Championships, held during the 2018 Adequan®/FEI North American Youth Championships, presented by Gotham North (NAYC). "For me, it is always a thrill to present the Albers Award. This year, when Martin Kuhn&apos;s name was announced, we came full circle," stated Roberta Williams, USDF FEI Jr/YR Committee Chair. "Martin himself had ridden in the NAYRC at Tempel Farms in 2002, where he was on the Region 2 Gold Medal team, and at Bromont in 2003 with the Region 2 Bronze Medal team. This year, as chef d&apos;equipe, Martin navigated his two teams through a multitude of issues and heartbreaks with the same good sportsmanship he displayed as a Young Rider fifteen years ago." The Albers Award is named in honor of long time USDF Region 1 Chef d&apos;Equipe, supporter, and good friend, Patsy Albers. 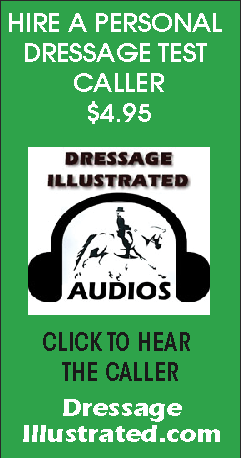 The award is presented annually at the USDF North American Youth Dressage Championships, to the dressage chef d&apos;equipe who best demonstrates the same level of dedication, enthusiasm, and team spirit shown by Patsy, throughout the years. The award is open to all of the dressage chefs d&apos;equipe, and any competitor or chef d&apos;equipe can nominate a candidate by submitting a written explanation as to why that chef deserves to win the Albers Award. 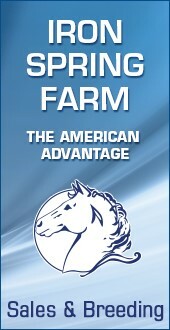 The NAYC is the premier equestrian competition in North America for youth, age 14-21. Young equestrians vie for team and individual FEI medals in the three Olympic equestrian disciplines of show jumping, dressage, and eventing, the Paralympic discipline of para-dressage, and the FEI World Equestrian Games disciplines of reining and endurance.